Xiaomi lifted the curtain from its Mi Mix 3 smartphone at an event on Thursday. The device comes with Magnetic Sliding Front Camera, Dual Rear Camera Setup, Two Selfie Sensor and Really Uninterrupted Display. Xiaomi Mi Mix 3 does not have any display niche, and at the lower part is not too bassy. The company has kept the different types hidden behind the sensor display. These can be used to activate the Magnetic Slider. The phone has fast wireless charging support. It comes with a 10 Watt wireless charger. Xiaomi Mi Mix 3 has a 24-megapixel front camera equipped with RAM, Snapdragon 845 processor, and AI, up to 10 GB. 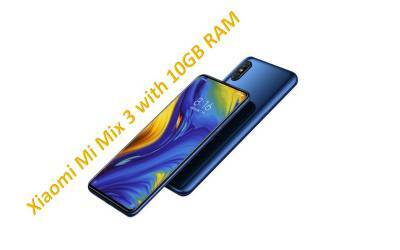 Price of Xiaomi Mi Mix 3Xiaomi Mi Mix 3 starts with 3,299 Chinese yuan (about 34,800 rupees). Variants of 6 GB RAM and 128 GB storage are being sold at this price. The variant of 8 GB RAM and 128 GB storage is priced at 3,599 Chinese yuan (around 37,900). The 8 GB RAM and 256 GB storage variants of this handset will be sold for 3,999 Chinese yuan (around Rs 42,100). This phone also has a Palace Museum Special Edition. Its design is unique and it comes with accessories. This variant of 10 GB RAM and 256 GB storage is priced at 4,999 Chinese yuan (about 52,700). The smartphone will be available on Onyx Black, Jade Green, and Sapphire Blue color. At the moment, Xiaomi has not said anything about making this handset available in India. There are a total of four cameras in this phone. Two rear cameras are provided with two front cameras. There are two 12 megapixel sensors on the back of the phone. There is a wide angle lens and another telephoto lens. The wide angle lens has a Sony IMX 363 sensor, which is F / 1.8 aperture. The telephoto lens has Samsung S5's 3M3+ sensor. Its aperture is F / 2.4. Other features include dual-LED flash, OIS, optical zoom, AI background music, 960 frames per second slow motion, AI Seen Detection, AI Bokeh, AI Studios and AI Seen Detection. The front panel has a 24-megapixel sensor and the other is a 2-megapixel sensor. These selfies come with light support. The front camera has the AI-equipped buffelation and Bokeh effect feature. The smartphone has a fingerprint sensor on the rear. The battery is of 3850 mAh. The connectivity feature includes dual 4G VoLTE, Wi-Fi 802.11 AC dual-band, Bluetooth 5.0, GPS, NFC, and USB Type-C port.